Screenplay – A killer plot but a very straightforward narrative did not help the film. The whole world knew that Susanna (Priyanka Chopra) is going to murder her seven husbands in the film but one expected some surprises and some twists throughout… the murders were lined up like a multi-course meal and we got entrée after the hors d’ourves as promised; in fact there comes a message at the interval point – ‘4 more to go!’ The film is full of brilliant moments and images like a Persian cat walking down a grave made of snow; John in a blue negligee playing chor-police; Susanna asking her poet husband, “who is Mukarrar” when he praises her couplet by using the Urdu word that means ‘again’; and Neil Nitin Mukesh dangling his amputated leg in his wife’s face, amongst many others. However, they somehow do not come together to leave a hangover like Vishal’s earlier films did. Priyanka Chopra – She dazzled in Vishal’s Kaminey but could not really pull off a complex character like Susanna. Not her fault, she tried and tried hard but that effort showed and she never became Susanna like she became Sweety in Kaminey or Kareena became Dolly in Omkara or Tabu transformed into Nimmi in Maqbool. She shines in a few scenes but not throughout the film. The writing also did not support her as you neither feel bad for Susanna, nor you hate her. She moves from one marriage to the other but there is just so much happening that you’re left to wonder if she’s started to enjoy it or is a pained soul. Climax – What saves the day is the superb twist in the end… the film lifts in the last ten minutes and Priyanka also delivers her best especially in the scene where she says, “this time I will drink his blood…” She appears sinister and then the surprise. Music – A brilliant soundtrack helps the film move forward. Vishal Bhardwaj and Gulzar once again create magic especially with the song, ‘Daarrling’ (vocals – Usha Uthup and Rekha Bhardwaj) and ‘Bekaraan’ (vocals – Vishal Bhardwaj). The two rock numbers one after the other distract and only one would’ve been sufficient. Cinematography – The scenes are set to create a mood and the lighting is dim… Vishal conceptualizes the scenes brilliantly and Ranjan Palit shoots them like never before. 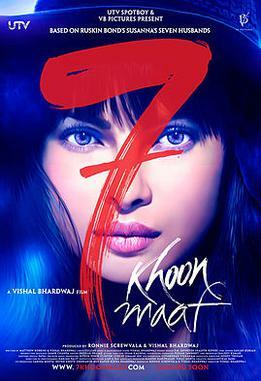 7 Khoon Maaf looks like a brilliant piece of art but falls short of being a brilliant piece of cinema. Make-up – The moment Susanna first appears on screen, you do not notice her but you notice her bad prosthetic make up that makes her look fake. A powerful scene is ruined with everyone discussing her cakey make-up around you. Of course, her journey from a young beautiful army wife to a middle aged frustrated woman requires her to look different but technical flaws like this take away from the emotion. The husbands, the supporting cast – Some worked and some didn’t but the film has a very interesting ensemble cast. Annu Kapoor as an opportunistic policeman, Keemat Lal is brilliant and so is Irrfan Khan as Wasiullah Khan, a gentle poet by the day and a masochistic lover by the night. Neil Nitin Mukesh as Major Edwin Rodrigues, an insecure and jealous husband is good while the Russian actor, Aleksandr Dyachenko as Nicolai Vronsky is just about ok. Naseeruddin Shah as Dr. Modhusudhon Tarafdar is miscast as you just do not relate to him talking with a Bengali accent; and John Abraham as a drug addict rock star has nothing much to add. Vivaan Shah makes a confident debut and is able to manage the growth in his character over the years (though make up fails him also).